A lot of cross-hatches could be called pseudo-crossovers, but the Honda WRV is a very convincing one. Head on, it looks nothing like the Jazz, thanks to the flat face, chunky chrome grille and black cladding. The headlamps not only get boomerang-shaped daytime-running LEDs, but the cluster design is stubby and aggressive.The side profile is where the Jazz DNA is most evident, but that’s primarily down to the character-line and silhouette. Otherwise, the WR-V looks truly distinctive and it’s not just because of the roof rails and 16-inch alloys. It’s 44mm longer and 57mm taller than the hatch it’s based on. Even the width is greater than the Jazz by 40mm and that’s largely down to the cladding. The wheelbase is also up by 25mm and this required rejigging the front and rear suspension points! At 188mm, the ground clearance is a healthy 23mm more than that of the Jazz, but don’t go snooping through the brochure looking for the water wading capacity. If you’re attending an off-roading class, expect the WR-V to get a doctor’s note so it can be excused. Unlike the outside, the interior of the WR-V doesn’t see much change from the Jazz. You get the same asymmetrical black dashboard with a touch-pad climate control unit, and the neat, large part-digital instrument cluster. You also get the same large dashboard which makes front and sideline visibility quite a hassle. What is new, however, is the gear lever and upholstery which will be available in two colour schemes – black with blue or black with silver.The WR-V also gets features like a new 7-inch touchscreen infotainment system and a segment-first sunroof. The infotainment system’s user interface is all-new too. It is an Android-based system, which is evident from the way it looks and feels, and supports Wi-Fi connectivity if you connect a Wi-Fi receiver to the USB port. So you can access websites from the system’s built-in browser using an Internet connection from your phone’s hotspot or from a dongle. 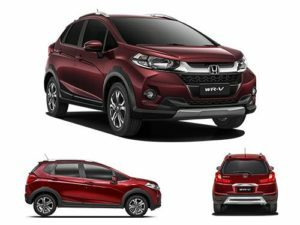 In terms of safety, the WR-V will get ABS and dual front airbags as standard features, so full marks to Honda for that. However, it does lose some of those marks because the rear passengers don’t get adjustable headrests, making rear-collision safety for them quite poor. Honda’s ‘man maximum, machine minimum’ philosophy ensures that there is ample space inside the car. There are quite a few storage spaces available too. But more importantly, the WR-V’s wheelbase is 25mm longer than the Jazz, while overall length has gone up by 44mm. This has just made an already spacious car even more spacious with very impressive kneeroom. Boot space has also increased by nine litres with a capacity of 363 litres. However, Honda is neither offering the Magic Seats like in the Jazz, or 60:40 split seats. With 100PS on tap, the WR-V’s 1.5-litre diesel is among the most powerful in the class. However, the on-paper numbers don’t translate to real world excitement, instead they dish out a lot of practicality for daily use. It’s a very easy and relaxed engine to drive. Turbo-lag is minimal and the turbo-surge is gradual. Factor in the light clutch and you’ve got a great city drive with part throttle inputs enough to hit 40-60kmph quickly. There is a fair amount of diesel clatter, though, and it’s particularly noticeable at city speeds, where you’re in lower gears. Overtakes do need a little planning since you won’t get that vigorous power delivery when you need it. Slam the gas pedal and there’s more noise than progress. Hover around 2000rpm, use the full 200Nm of torque, upshift early and the WR-V will give you little reason to complain. During the 0-100kmph test, we quickly realised tickling the red-line is moot. Getting the 12.43 second time meant upshifting before 4000rpm was key, post which, the power simply vanishes. There’s no getting around the i-DTEC’s efficiency-focused nature, but that does pay off, especially on the highway. The added 6th gear helps the engine sit calm at just under 2000rpm while cruising at 100kmph and you can hit higher speeds without the engine feeling strained. The sixth-cog also helps get it an impressive open-road fuel economy of 25.88kmpl! That last gear does make a massive difference, which is why the city FE sits at 15.34kmpl – frugal standalone but over 10kmpl less than the highway figure.